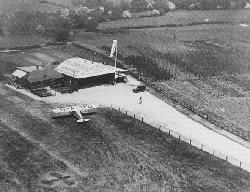 In 1931, Gloucestershire Airport began life as Down Hatherley airfield, on a site adjacent to its present location. The Westgate Motor Company of Gloucester set up a dealership for de Havilland Moth aircraft and demonstrated them from this site. In the same year, The Cotswold Aero Club was formed at Down Hatherley and still operates to this day. In 1936, showing considerable foresight, the joint Councils of Cheltenham and Gloucester purchased the present airport’s land on the other side of the Cheltenham Road. The beginnings of the airport we have now were constructed and the Down Hatherley operation moved across the road. The new airport was named Staverton. During World War Two, Staverton served as an RAF training base. Also, during the 1940s, flying pioneer Sir Alan Cobham helped develop in-flight refuelling here. 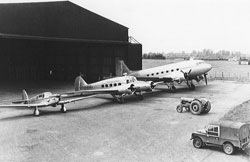 In the post war years, Staverton flourished in the General Aviation role. It was a popular club and business airfield. For many years Smiths industries based their flying test bed aircraft at the airport – a Vickers Varsity initially, then later a Hawker Siddeley 748. Destinations such the Channel Islands, Dublin and the Isle of Man were also serviced by scheduled flights, operated by regional airliners including the DC3, Herald, Viscount and Shorts 3-60. During the 1960s and 70s, the airport became the home of the Skyfame Museum. This was one of the first museums in Britain to dedicate itself to the preservation of Second World War aircraft. Some of its aircraft were flyable and the annual Skyfame air display was one of the great highlights of the airport calendar. In the 1990s, the airport became an important helicopter centre, with Police Aviation Services and Bond Air Services establishing their headquarters here. In 1993, Staverton was renamed Gloucestershire Airport to reflect its increasing prominence as the business aviation centre for the county. Today it is a thriving business and recreation airport handling around 90,000 movements each year. Its location, facilities and four runways provide the perfect site for aircraft from the Tiger Moth to the ATR42 and the PA-28 to the Dassault Falcon.